Dubai, UAE, June 29, 2017: Gant is an American lifestyle brand with a classic East Coast collegiate heritage, offering quality, authenticity and effortless style. Gant is the original “Prep,” founded in New Haven, CT in 1949, when the company first began plying Yale undergrads with perfect broadcloth shirts. Gant Time’s collection is designed to balance the brand’s elegant leisure lifestyle heritage with the fast-paced needs of today’s business and sports customer: crafting each timepiece not as merely a luxury item, but as an affordable, essential and trusted everyday accessory. 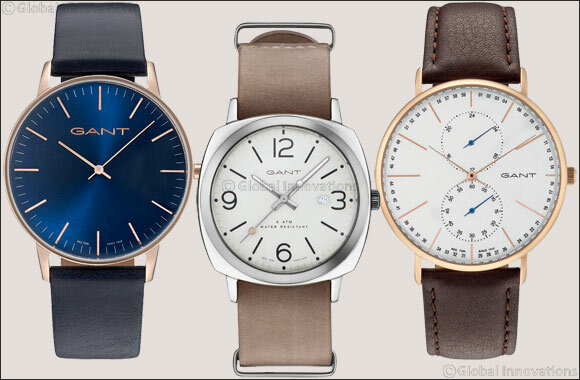 The new collection of Gant timepieces convey the brand’s spirited take on all- American classics with fashion-forward timepieces that capture your attention with effortless chic. Reintroducing popular colour palette of rose-gold, black and blue, the timepieces are laid back with the right degree of structure and classic appeal. Laid back with just the right degree of structure, the classic shape of the GANT Denville features a bright modern palette giving it a clean and innovative design that will define your seasonal looks to come. Blue hour markers pop from the white dial and stainless steel case, contrasting with the warm, brown leather strap and giving it a sporty sophistication. The hands and long rectangular indices match the GANT lettering and a crisp tailored element, resulting in a watch that is refined without trying too hard. The Denville perfectly complements any warm weather style, be it a button-down shirt on your bike ride to an important meeting or paired with your leisure attire for a long weekend at the country house. As the new generation of Americans is always reinventing the smart look of the classic oxford shirt, GANT proves once again, that any style can be brought back with a fresh new face. The Brookline by GANT is a contemporary watch with an unmistakable 60’s flair. The black and white index is perfect for the retro, square-shaped dial. This is a traditional three handed watch with modern features such as the date window. The brown genuine leather strap pulls together this Bob Dylan era inspired timepiece to polish off your causal wear with the perfect touch of preppy. Whether your day calls for slacks or great fitting jeans, the Brookline will give you that original East Coast prep finish. GANT’s Wilmington is a high performance, all American watch for the cosmopolitan man leading a busy lifestyle. Open, warm, not too ornate – this play on the traditional men’s watch takes it up a notch and redefines preppy elegance. Classically shaped with refined hour markers and hands on a large white dial gives it an expansive feel. Fine, IP rose gold metal is the look of the season. Understated subdials with blue subdial hands provide a sporty active detail that contrasts with the warm tones and keeps the design casual. More than just beautiful, the subdials and seconds give this watch a functionality that goes beyond form. Stepping out of the comfort zone, GANT offers the Detroit timepiece in preppy blue color. The earth toned Detroit, whose color choices reflect the ecological inspiration also visible in the House of GANT apparel collections this season. Sporting a bold, sunburst blue dial with a bright white index, red second markers and the signature blue second hand. At 41 mm, the watch is encased in stainless steel with dark and light brown leather bands completing the natural color palette.